This lovely border die was from Ali express and was £1.62p. It cut lovely. To make the card i used a blank a6 card i made myself, I then matted the card with a blue pearlescent card stock leaving a small border. I cut the border die twice from a silver card, I then stuck the borders onto the blue card one at the top and one at the bottom. 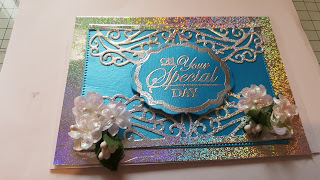 I heat embossed a sentiment from a do crafts stamp set using wow silver embossing powder. I then cut out the sentiment using a die from a spellbinders nesting die set. I used foam tape to stick the sentiment to the middle of the card. I then used white flowers to decorate the bottom two corners of the card. I enjoyed making this card and was pleased with how it looked.